Young Andy Malloy is surrounded by tragedy and trouble. His stepmother is dead. His father, accused of her murder, is on the run from a posse led by a brutal sheriff with demons of his own. Andy’s investigation into the crime is about to put him in deadly danger. And the truth, not to mention Andy’s own life, may rest in the hands of a pathetic town drunk and a freckle-faced redhead . . . BRANDED is a classic novel by the master of Western noir, Ed Gorman. 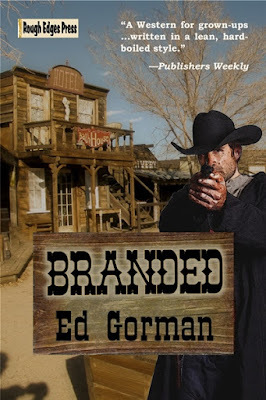 Filled with compelling characters, breathtaking suspense, and stunning plot twists, it’s a yarn guaranteed to please Western and mystery readers and a novel not soon to be forgotten.